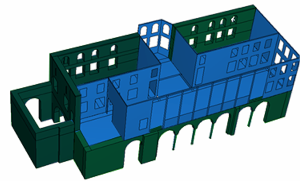 Depiction of the structural elements of the monument: masonry (green) and timber construction (blue). The house, standing in the center of the property, is a two-story rectangular structure, measuring 9.30 x 23.70 m., with a stone-built ground floor and mainly timber superstructure. It has two courts, the north and south. From the interior of the house, immediate access is granted to the north court, still walled today, through an arched portico on the ground floor and a wooden hayiati on the upper story. The garden of the mansion once lay to the south. This space, overlooked by an enclosed balcony (sachnisi) projecting from the center of the corresponding façade of the mansion, is reached from the north court via a passage. The side façades of the mansion on the east and west were once unencumbered, as windows were found there that had been blocked by later buildings. The initial property must have generally been much wider. It likely included the area to the south in which a medieval olive press has been found, and the ground floor of the structure appears to have continued further to the east, perhaps as a single-story structure with a roof terrace. The mansion. View from the court. The stone-built ground floor is comprised of three closed rooms and the portico. The rooms of the ground floor preserve evidence of the construction history of the mansion. The arcade of the portico is also interesting as it is supported by slender monolithic marble columns with truncated conical capitals, decorated with reed and acanthus leaves. As was common, the Benizelos family situated the auxiliary functions of the house and installations relating to economic activities on the ground floor. Large storage pithoi (jars) have been found for the storage of grains, oil and wine, as well as a system of wine presses and containers for the mustos (must). In the court of the mansion there was a well, and incorporated into the side of the built staircase leading to the upper story was a wash basin. These two elements, associated with providing water for household needs, are characteristic of noble houses of the period. 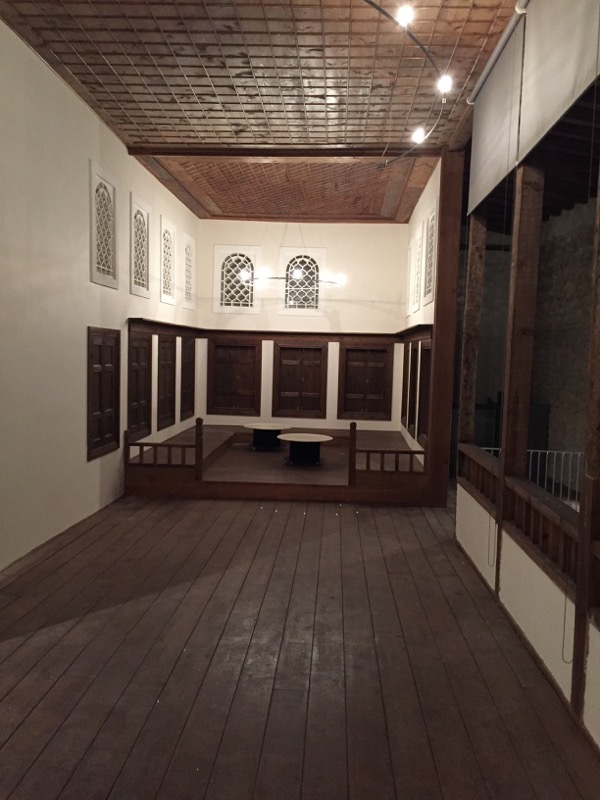 View of the hayiati with the sofas. 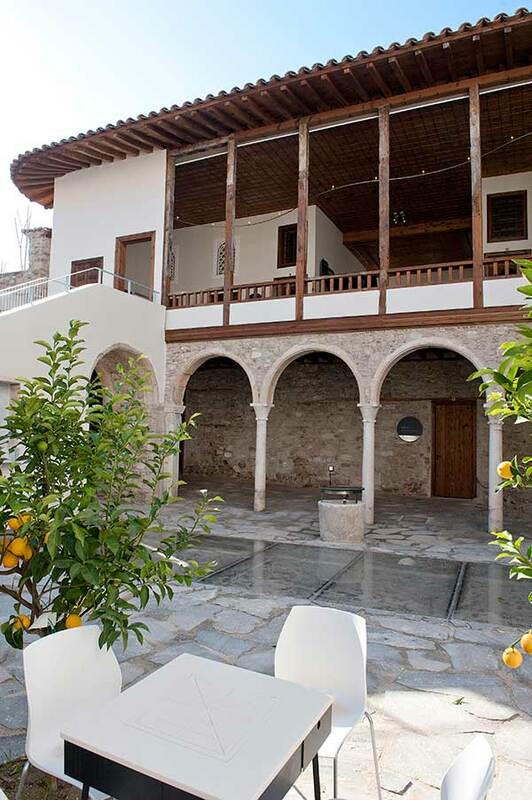 The upper story, constructed of mainly timber-frame walls (tsatmas), is the main living space. Two basic elements shape the plan of the upper floor, the ontas (the room unit for all daily activities) and the hayiati (an open passageway towards the rooms, with sitting rooms – sofas – at its ends and the orta-sofas in its center, facing south). 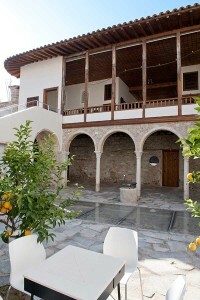 The Benizelos mansion had two symmetrically arranged ontas – the winter with a fireplace and the summer – which were accessed through a wooden two-story partition screen that completely occupied one of the narrow sides of the ontas. The ontas had a series of relatively small stained glass upper windows. 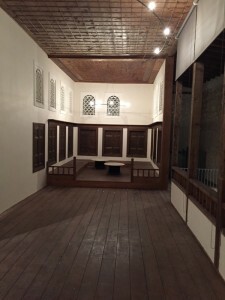 A characteristic of the upper-story rooms is their flexible furnishings and internal arrangement that could be rearranged to meet different needs over the course of the day. The careful woodwork and the examples of decorative woodcarvings found here are common in the konakia of the period.